Happy Friday my friends! I don't know about you, but I couldn't be happier that the weekend has arrived. Lets just say that the twins have been more than a handful this week, and I'm finally getting a first hand experience at what the terrible twos are all about. Time to start pouring the wine! This is the outfit I wore last weekend when we had a family day in Boston. Newbury Street was closed down to all cars, so a lot of people were out walking the street, making it a perfect day for people watching, and of course, shopping. The funny thing is that I didn't plan on wearing these booties when shooting this look. However, we popped into Nordstrom Rack on Boylston Street, and I found these Dolce Vita booties and had to have them. Not only do I love the open toe, but the open heels makes them perfect for transitioning into fall. I can wear them now with sundresses, then far into the fall with jeans and a leather jacket. Of course, since I was doing photos of my look later that day, I had to wear them, and glad they paired perfectly with my outfit. Not only am I excited about my new booties, but I'm in love with this striped off the shoulder blouse. 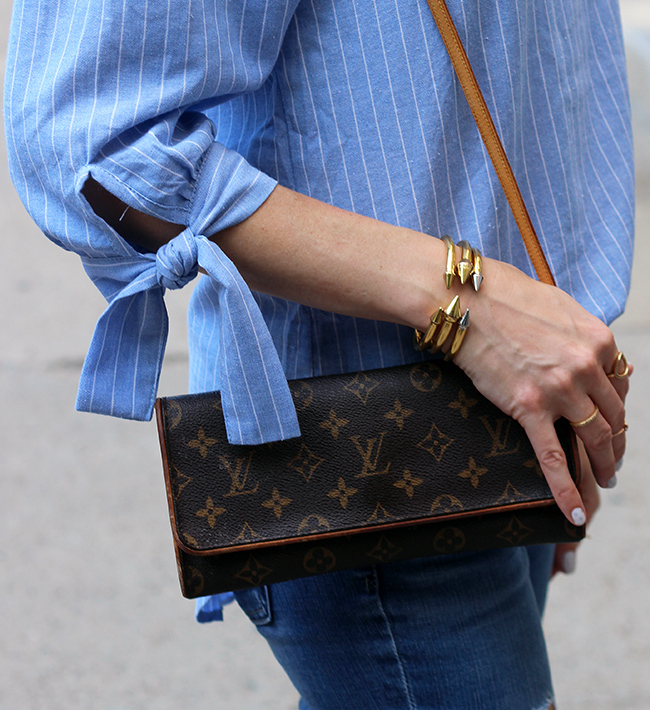 You all know that I love classic pieces that have a fun twist, and there is nothing more classic than stripes or more fun than an off the shoulder blouse. I paired it with distressed jeans for an casual look, which may have been a tad to heavy for eighty degree weather, but I can guarantee you I'll be living in this outfit this fall. I'm happy to announce that the Jamberry winner is Erica Lawerence! Please send me an email at threadsforthomas@gmail.com to claim your wraps! This week we have four feature bloggers of the week! There was a four way tie for the most clicked link, and we'll be featuring all four between our three blogs. I'm happy to feature Jessica from J Petite. I love her dress, and can't get enough of those sunnies! Make sure to stop by her blog and say hello, and don't forget to head to Sheree and Melissa's blogs to see who else made feature blogger of the week. Such a cute top!! Stock up on the wine each age is more fun then the last!! Lol!! Such an amazing style, so love the off-shoulder top! Your striped top is darling and I love those booties! This is such a chic look! Have the best weekend! Love love love the off the shoulder top !!! Gorgeous outfit !! Those jeans look so great on you! I love the boots you found. Hope you get a break this weekend. I would love to wear that outfit! It looks very Cool on you! Fancy Friday linkup is on! Love how you wore booties to make this a great transition to Fall look!! Off-the-shoulder tops look SOOO good on you! Love this classic print! And the booties are fabulous, too! Glad they fit right into the photo shoot outfit of that day! 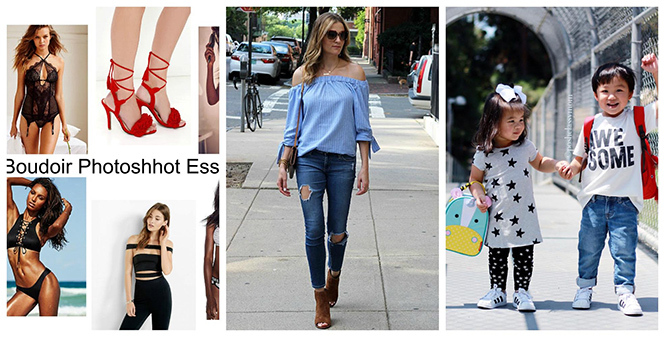 I really adore this off the shoulder top on you! I have a sort of similar top I wore this week on my birthday. That bracelet you have on is really pretty and I also love your layered necklaces and boots! Cute look! Love those shoes! I need these booties! They are the perfect transitional boot! This is the perfect outfit! I have a top similar and think I have to recreate this! I am so down for off-the-shoulder anything, and this blouse is gorgeous! Forever obsessed with this OTS top and those booties! I love the pretty sleeve details on this top, gorgeous look! Love this top! Perfect look! I love your top! I almost ordered the same one from Shein but ended up ordering a similar one from Asos. I might have to get this one too! Loving your stripes, the top looks fab on you! I wouldn't of been able to contain myself with those booties either... Your giving me fall fever for sure. Hope you got some down time on the weekend! Stunning top, perfect with these distressed jeans Racheal! This is the perfect outfit! I love it.